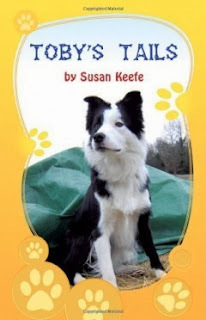 Toby's Tails is a children's book about the first year of life of a young Border Collie, Toby. The book is told from Toby's point of view: from the moment he opens his eyes and discovers the other animals on the farm through to going to his new home and learning all about life in general. This provides an unusual perspective and one that supplies a good opportunity to explore and empathise with Toby's feelings such as when he is scared of the camera and the TV. Seeing the world through his eyes also enables the author to educate in an interesting way. When Toby, for example, wants to relieve himself, he discovers that he gets praised for going outside so decides that he will do things in this way again. This explains to children the concept of how to teach housetraining using positive reinforcement techniques that the puppy will understand. The language is generally simple, readable and appropriate for children but the author doesn't shy away from using mature language where appropriate such as 'rhythmic', 'reprimands' and 'desolate'. This can be considered a good way to extend a child's vocabulary. The only question mark hangs over whether the author should force themselves to be constrained by the basic premise they have set up. Should the puppy's understanding and that of the creatures around him be limited to what animals could, in reality, understand? Should the language of the people in the story sound like natural speech? Or are the characters in the story just a vehicle for education? Toby discovers a lot by asking Lucky the Golden Retriever he lives with and through conversations with local wildlife. He learns about birth and illness, the lifestyles of the animals around him, why colostrum is important to the farmyard goat kids, how bats use sonar to locate their food, and the difference between warm and cold blooded animals. The only difficulty with this is that much of what the animals discuss would, in reality, be beyond their understanding and as such feels rather unnatural. A child may well not have a problem with this and may just find it a fun way to learn about a range of interesting subjects. The dogs within the book also understand every word of English said to them by the humans in the story, such as when they are going to get fed or what town they are in. Unfortunately, the belief that dogs should understand our spoken language often leads to problems with people and their pet dogs so it might be worth ensuring that children were aware that this ability is within the constraints of this book and not actually a reality. Overall, it's a nice little book that would be suitable to read to a younger child, or for an older child to read to an adult or even to themselves.